New York, April 10, 2014--Swaziland police on Wednesday re-arrested veteran editor Bheki Makhubu and human rights lawyer Thulani Maseko three days after they had been released from prison, according to news reports. The two, who were first jailed on March 18 and held until Sunday, had written articles that criticized Swaziland's chief justice, the reports said. On Wednesday, High Court Judge Mpendulo Simelane issued new arrest warrants for Makhubu, editor of the independent newsmagazine The Nation, and Maseko, alleging that the two had failed to heed an April 1 court order to appear before him, the state-run Swazi Observer reported. Makhubu and Maseko appeared at the High Court in the capital, Mbabane, today, and were sent back to prison pending a court date on April 14, according to the Southern Africa Litigation Centre, a regional human rights group. The two were first arrested on the order of Swaziland Chief Justice Michael Ramodibedi, and charged with contempt of court. On Sunday, Judge Mumcy Dlamini nullified the arrest warrants and ordered the two to be released. Ramodibedi immediately appealed the decision, according to news reports. It is not clear if the contempt charges still stand. The arrests were in connection with separate articles each wrote that criticized Swaziland Chief Justice Ramodibedi. In a February column for The Nation, Makhubu criticized Ramodibedi for contempt of court charges given to the government's motor vehicle inspector, who was arrested after impounding a vehicle used by another judge, according to news reports. The individual was released on bail, and his trial is pending. Maseko wrote an opinion piece, "Mandela: lessons from a great man on leadership," which was also published in The Nation's February issue, in which he criticized the state in connection with the case with the motor vehicle inspector case. 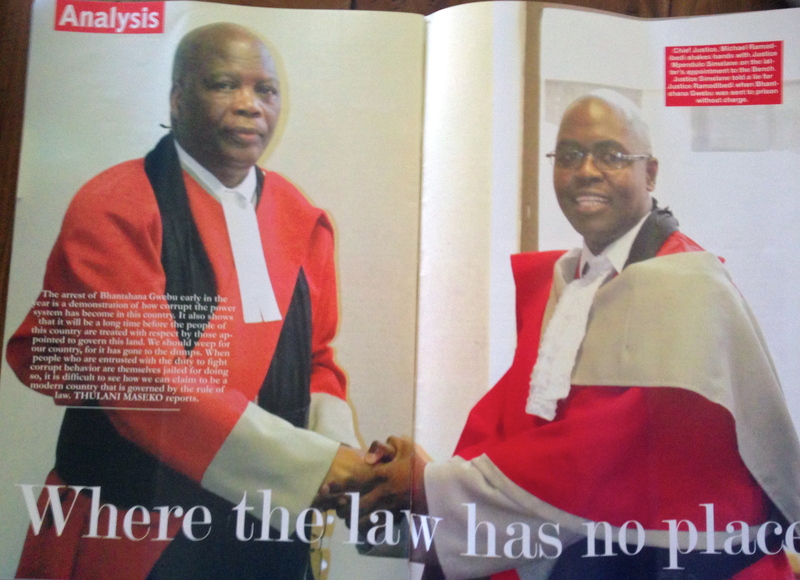 High Court Judge Simelane was also mentioned in another one of Maseko's critical articles. "The only crime in this case is judges abusing the judicial system to settle personal scores," said CPJ Africa Advocacy Coordinator Mohamed Keita. "We call on authorities to drop all charges against Bheki Makhubu and Thulani Maseko and release them immediately."